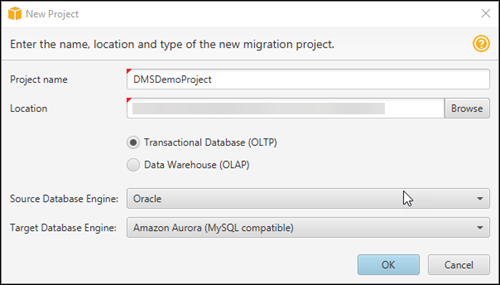 Before you migrate data to Aurora MySQL, you convert the Oracle schema to an Aurora MySQL schema as described following. Launch the AWS Schema Conversion Tool (AWS SCT). In the AWS SCT, choose File, then choose New Project. Create a new project called DMSDemoProject. Enter the following information in the New Project window and then choose OK.
Use the default Projects folder and the default Transactional Database (OLTP) option. 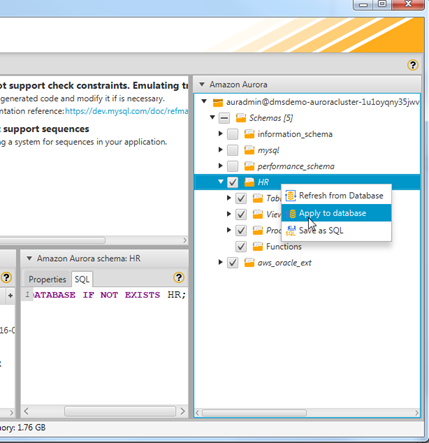 Choose Amazon Aurora (MySQL Compatible). Choose Connect to Oracle. In the Connect to Oracle dialog box, enter the following information, and then choose Test Connection. Use the OracleJDBCConnectionString value you used to connect to the Oracle DB instance, but remove the JDBC prefix information. 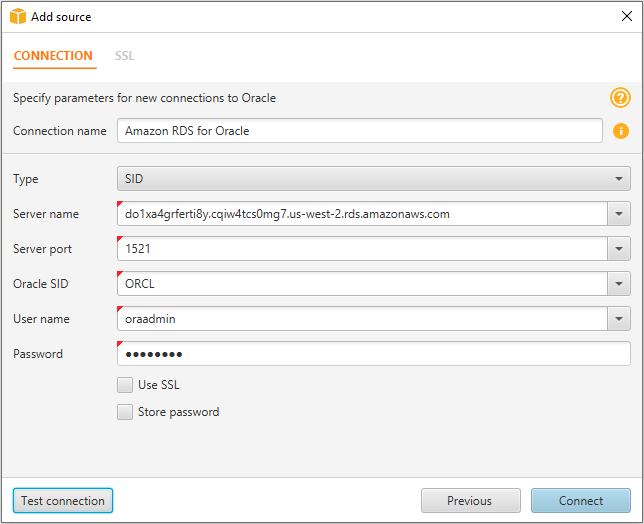 For example, a sample connection string you use with SQL Workbench/J might be "jdbc:oracle:thin:@do1xa4grferti8y.cqiw4tcs0mg7.us-west-2.rds.amazonaws.com:1521:ORCL". For the AWS SCT Server name, you remove "jdbc:oracle:thin:@//" and ":1521" to use just the server name: "do1xa4grferti8y.cqiw4tcs0mg7.us-west-2.rds.amazonaws.com"
Choose OK to close the alert box, then choose OK to close the dialog box and to start the connection to the Oracle DB instance. The database structure of the Oracle DB instance is shown. 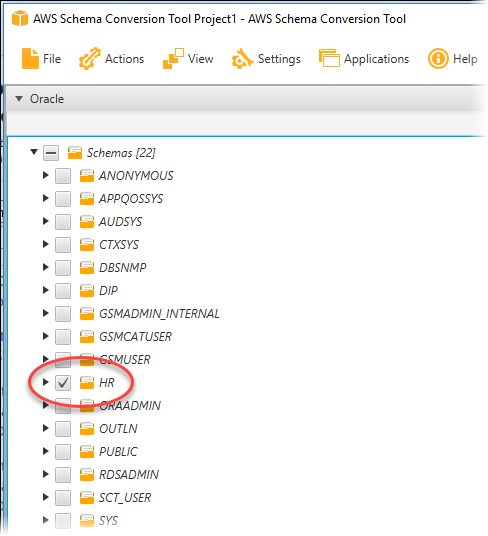 Select only the HR schema. Choose Connect to Amazon Aurora. 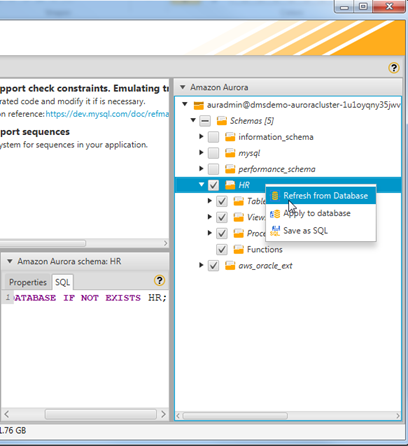 In the Connect to Amazon Aurora dialog box, enter the following information and then choose Test Connection. 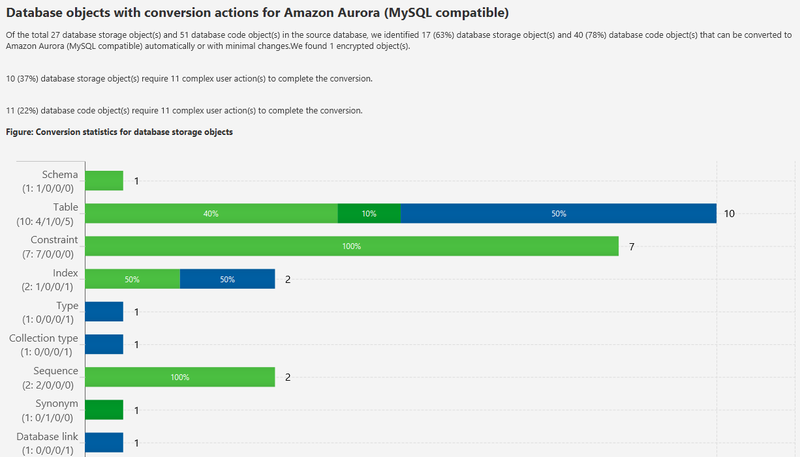 Use the AuroraJDBCConnectionString value you used to connect to the Aurora MySQL DB instance, but remove the JDBC prefix information and the port suffix. 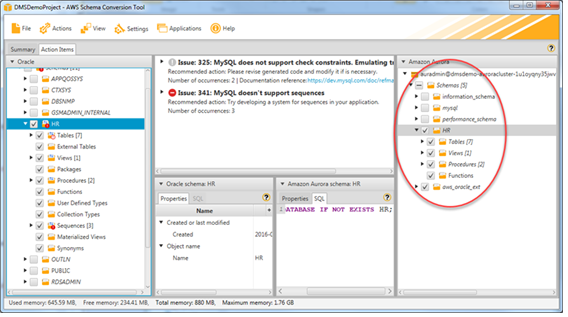 For example, a sample connection string you use with SQL Workbench/J might be "jdbc:mysql://dmsdemo-auroracluster-1u1ogdfg35v.cluster-cqiw4tcs0mg7.us-west-2.rds.amazonaws.com:3306". For the AWS SCT Server name, you remove "jdbc:mysql://" and ":3306" to use just the server name: "dmsdemo-auroracluster-1u1ogdfg35v.cluster-cqiw4tcs0mg7.us-west-2.rds.amazonaws.com"
AWS SCT analyses the HR schema and creates a database migration assessment report for the conversion to Amazon Aurora MySQL. 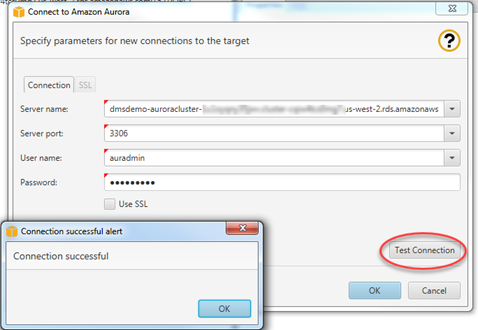 Choose OK to close the alert box, then choose OK to close the dialog box to start the connection to the Amazon Aurora MySQL DB instance. Right-click the HR schema and select Create Report. You can optionally save the report as .csv or .pdf format for later analysis. Choose the Action Items tab, and review any recommendations that you see. Right-click the HR schema, and then choose Convert schema. Choose Yes for the confirmation message. AWS SCT then converts your schema to the target database format. 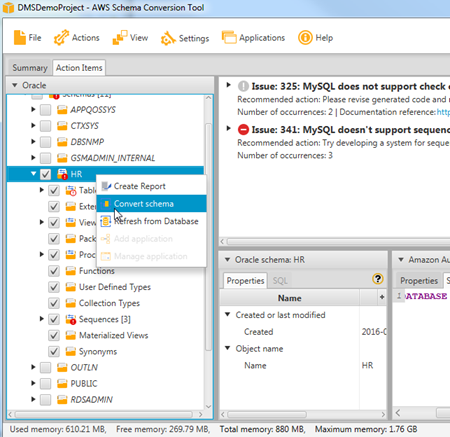 Choose the HR schema, and then choose Apply to database to apply the schema scripts to the target Aurora MySQL instance, as shown following. Choose the HR schema, and then choose Refresh from Database to refresh from the target database, as shown following. The database schema has now been converted and imported from source to target.